You can't help but smile and feel happy when you look at a confident Dachshund: proudly carrying the elongated & muscly body on short legs. The long shaped head held high while keenly observing the world with it's beautiful intelligent eyes. The short legs allow Dachshunds to dig and maneuver through the underground tunnels. Dachshunds are brave - and sometimes a little stubborn. They have an intelligent and independent spirit, especially when hunting. 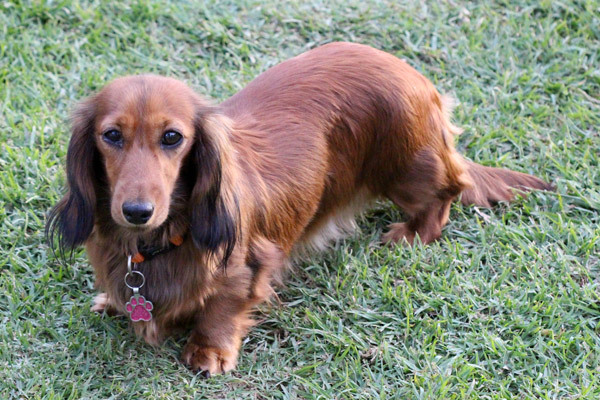 Dachshunds are playful by nature and love to be close to you, spend time and "help". Dachshunds often bond closely with a single person. Dachshunds are scent hound dog breeds who were bred to hunt badgers and other tunneling animals, rabbits, and foxes. Today their versatility makes them excellent family companions as well as show dogs. Dachshunds make a delightful addition to any family, largely due to their cute appearance and lively disposition. IN fact - they have ranked as one of the most popular dog breeds for decades. Smooth Dachshunds seem to be the most popular variety. The coat is short and shiny and needs very little grooming. In colder regions of Australia - they do need, however, a sweater in the winter to help them to stay warm. Long haired Dachshunds have sleek, slightly wavy hair. They should be brushed every day to maintain the coat in best condition. Wire haired Dachshunds have wiry, short, thick, rough coats with bushy eyebrows and a beard. They won't need a sweater in the winter, but they do need to be brushed regularly. 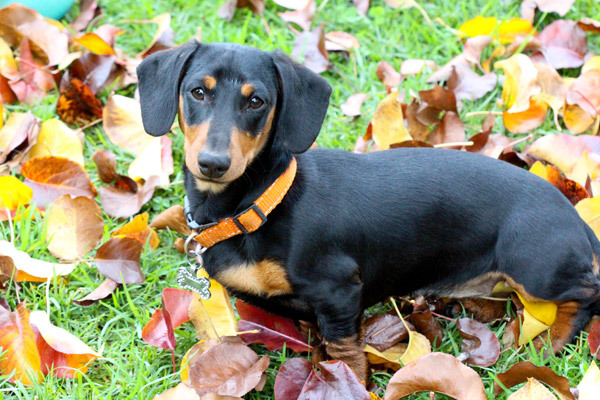 Common colors in Dachshunds are: red, cream, black and tan, black and cream, chocolate and tan, blue and tan, and Isabella (fawn) and tan. 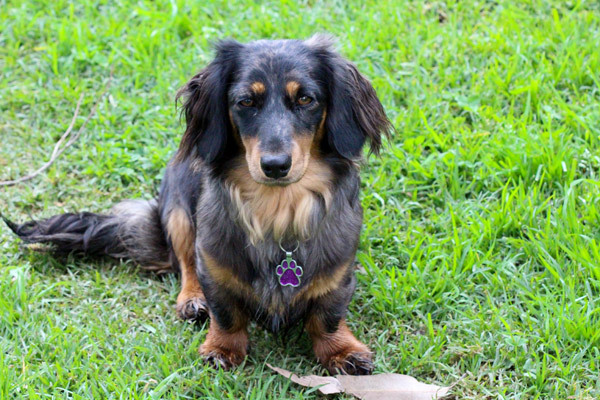 Dachshunds also can have patterns in their coats, such as dapple (a mottled coat pattern), brindle, sable, and piebald. Dachshunds have a lot of stamina and energy. They love to take a walk or play outdoors with other dogs, and they like to hunt and dig. They are also active inside the house and can do well in small living quarters so long as they get a moderate amount of daily exercise - making them a popular apartment or city dog. If your Dachshund stays inside (apartment / unit) most of the day, you should take it on two short (~10 minutes) walks every day. When you hold a Dachshund, always be careful to support his rear and his chest. Dachshunds can learn quickly IF properly motivated. You must have patience, consistency and lots of love when training a Dachshund. Use positive reinforcements such as food rewards or a favorite toy to hold attention. Frequent SHORT training sessions bring better results than long forced ones. Your Dachshund will quickly become bored if made to repeat the same exercise over and over, so make it fun and interesting. House-training can sometimes take a little while with Dachshunds. Your Dachshund may not actually see the NEED for eliminating outside. Please be patience and consistent as this approach WILL bring you results with time. Other grooming needs include nail care and dental hygiene. Trim your Dachshund's nails once or twice a month. If you can hear them clicking on the floor, they're too long. The earlier you introduce your Dachshund to nail trimming the less stressful the experience is. Dachshunds are good with children in their own family (they may not be as fond of your children's friends - please ensure to supervise at all times). You should train your children to handle your Dachshund correctly! With his long back, they can be easily injured if not handled properly. A young child should handle the dog ONLY if sitting on the floor. As a general rule, Dachshunds get along well with other pets. Due to their bold and energetic personality, they may well become top dog. PLANNING TO ADOPT A DACHSHUND? Fill in our adopt a puppy questionnaire!